The bulls-eye on the Comets’ backs just got a lot bigger for teams trying to overtake Penn Manor field hockey. Number 16, Renee Suter marches up field staying focused. Her goal this year is to contribute to a Pennsylvania state championship. “Every team out there wants to beat us or even just score on us,” said All-American Renee Suter. 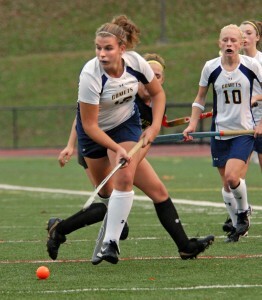 Lancaster is one of the top counties in the nation for field hockey according to Suter. “This makes it not very unusual for a team inside central Pennsylvania to be ranked number one,” Suter said. Last year the Comets won the state championship and hope to have the same results this year. “We have very high expectations and truly do hope to have similar situations as last year,” said head coach Matt Soto. The team is lead by Jill Witmer, who is being heavily recruited by the University of Maryland, the number-one, college-ranked team in the nation. Witmer is trying to take the role of some of the key seniors who were lost from the previous season. “Some players think it’s best to be totally under the radar, and to not be familiar with their rank,” she said. However Suter doesn’t have a preference either way. “I mean Lancaster County is such a good area for field hockey that they know most teams in the area are good and they expect it,” said Suter. “It’s just now it’s public that we are number one in the nation,” she said. The Penn Manor Comets will continue to attack their goal of another state championship. I did not know that our field hockey team was number one in the country!! Great Job!!! I think this is interesting. Our school is Number 1.